If gas grid is out of reach in your case, you will most probably be able to use an electical heating system for your house since pretty much every house in the UK has got electricity. Electric heating systems are on the rise the recent years, as a result of of an increased eco-responsibility in the UK households. Many homeowners across the country are starting to use electric heating to protect the environment but also to benefit from this new heating technology. Why choose electric central heating? Electric central heating systems minimize the risk of accidents, since they do not emit any harmfull gases and they can also be eco-friendly, if the electricity is produced from renewable energy resources. Electic central heating can easily warm homes where traditional heating methods, such as oil and LPG are not an option. Electic boilers are more efficient, when comprared with modern gas, oil and LPG boilers, with a heat pump efficiency that can reach up to 350%. Electic heating systems offer increased localised control, as you do not need to fire up the whole system to heat a singe room. Finally, by installing an electic central heating system, you could be better off financially, as oil and gas prices depend on the avaiable reserves, which are both decreasing. What is an electric central heating system? An electric central heating, is a home heating system that uses electricity to generate heat rather than oil or gas. Electric central heating systems are considered more eco-friendly,efficient and offer more control. Electric heating options are infrared heating panels, heat pupmps, storage heaters, electric radiators and electric boilers. As electric night storage heaters do not need flue or pipe-work, the cost of installation is normally much lower than that of gas central system. Such heating systems, containing almost no major moving parts, do not require much maintenance, and yearly servicing is not essential either. Almost all households in the UK have electricity, which is not the case with gas. The cost of electricity is higher than that of gas per unit. Since both the cost of electricity and gas are increasing, it is unlikely that the price will drop in the future. With tariffs such as Economy 10 or Economy 7, the day expense of electricity tends to be higher as compared to normal day electricity rate. Therefore, although you will save your money during the night when running your night appliances, you will actually spend more money during the day! With night storage heaters,you cannot get instant heat! You will surely get heat so long as those bricks are warm, but in case you didn’t use the system for a while, it will take almost a day to heat your house after you turn it on. A few modern models come with instant heating option too though. Some heaters are equipped with charge control that adjusts heating according to the room temperature automatically. But if you have a model that cannot do so, you will have to make adjustments manually with changing weather. The most common types of electric heating are radiant heating and convection heating. With radiant or conduction electric heating (radiators), you will have a device that heats up surfaces within a small area, such as parts of the bathroom, or the area in front of your desk. Radiators provide direct heat and are the most common form of heating in the home. Convection heating makes use of hot air to heat the room. While some people don’t like the idea of hot air circulating in the room, convenience is mostly a question of professional installation and well-planned heat distribution. Using air circulation, convection electric heating can heat your home faster and more efficiently. Also there’s natural convection that happens in a regular central heating radiator: cold air is being heated up, rising through the radiator and then streaming out on top. What is the best heating system for homes? Electric radiators are 100% efficient compared to gas boilers, which are only 90% efficient, when trasferring electrical energy to heat. There is a wide range of electical products to choose from such as electric radiators, infrared panels and electric towel rails that each has something unique to offer. You could always look into installing new electric radiators instead of ordinary combi-boilers or old-fashioned central heating systems. Electic radiators do an equal job of keeping your home heated for prolonged periods of time- all you have to do is simply purchase a new unit and plug it in to the nearest electrical outlet. To help get you used to the idea, we have outlined the some of the most popular advantages of switching to electric radiators that might be able to help you make a final decision. 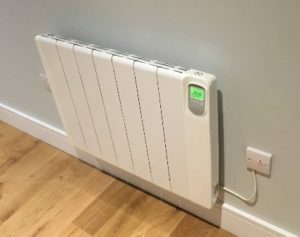 Quick Installation: Whether you opt for a few stand-alone electric radiator units or an in-built system that can be controlled from a single source, electric radiators can be fully fitted in less than a day. All you need to do is hire an electrician who has good experience in home heating and that will comply fully with the British Building Regulations Part L on the conservation of fuel and power in domestic properties. With no complicated pipe work, things can be up and ready to use in a matter of hours. Easy to Use: Once they’re fitted electric radiator systems are also simple and easy to use. Most come with comprehensive control panels to regulate temperature and make sure you have heat on demand – you can even turn some units off while others supply the heat you need in the room you’re currently occupying! Stand alone units can also be plugged straight into an ordinary 13-amp socket, just like an ordinary electrical appliance. Little Maintenance: Unlike complicated boilers and gas and pipe-based heating systems that have parts that might wear out or break down, electric radiators don’t require any repairs or long-term maintenance – plus some still come with up to 15 year warranties, proving them to be a durable and long-lasting heating option. Safe and Secure: Because electric radiators don’t burn fuel internally, you also immediately cut the risk of any potential carbon monoxide leaks or subsequent explosions. Plus units can be fitted by a fully qualified electrician or contractor onto the wall safely and securely if you have an in-built system – wherever you want them. Energy Efficient: Finally, electric radiators are a 100% efficient at the point of use, as no heat is wasted as it is originally generated – making it an eco-friendly heating option for your home, so long as you remember to turn the units off when they’re not in use! Infrared panels work with infrared radiation, which a form of electromagnetic radiation. Infrared heating has only recently started being used in domestic and commercial enviroments. Infrared heating panels emit radiation, which travels unobstructed in the air until it hits an object. When the radiation hits an object, it gets absorbed by it, affecting its molecular status, producing heat. When the human body comes into contact with the waves produced by the infrared panel, the rates penetrate and heat it. Any object that comes into contact with the waves that the infrared panel produces ,vibrate and radiate heat, warming all the surounding environment and solid bodies. Easy installation: Infrared panels are ready to use after you buy them. All you need is place to hung them and an electrical power outlet. Prevent mold growth: Infrared heaters will help prevent mold from growing in your walls, as they primarily heat solid objects. No maintence: Infrared heating panels do not require any maintenance, compared to traditional radiators. Cost Effective: Infrared technology is more efficient at heating a room than conventional convection heaters, so you spend less money on heating bills. Clean energy: Infrared heaters do not burn any fuel so they do not have any emissions thus being more enviromentally friendly. Heat loss: The walls, ceiling, doors and windows absord radiation keeping the ambient temperature more stable during the whole day, resulting into less heat loss. Child & Pet Friendly: Given how compact and lightweight these unites are , they can be placed higher on the walls than traditional heating radiators, which make them also safe for pets and children. Save space: Infrared heating units are compact and therefore they can be designed in a way to save space (a mirror in the bathroom). There are two main types of heated towel rail: either a gas-powered design that connects directly to the main central heating system, or an electric model with an on-off switch that functions separately from the heating in your home. Both options are popular and almost equally efficient, so the choice is completely up to you; a good idea would be to call in a plumber to do a quick survey of your home and ask them to recommend the design that would best suit your current heating system. If you have a combi-boiler, for example, then an electrical model might be in your best interests and cheaper to install. Whatever rail you get, make sure it complies with the EN442 European Standards for such heating elements. Heated towel rails are specifically designed to retain heat within the vicinity of the operating fitting, allowing you to experience the warm and cosy sensation of a nicely-heated, soft towel as soon as you are finished up in the bathroom. 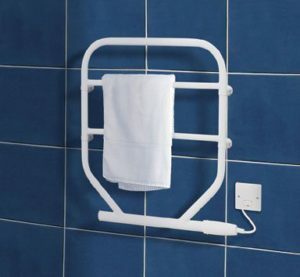 Rails also come in a range of sizes designed to suit both hand and full-body towels and can therefore be fitted in both large upstairs bathrooms and smaller downstairs, single toilets if necessary. They are available in a wide range of materials, from brass, chrome and stainless steel as well as offering a bunch of styles to choose from, including traditional straight railings or funky, contemporary curving or wavy designs. To a lesser extent, heated towel rails will also keep your bathroom relatively warm (if it isn’t too large), saving you money on expensive energy bills by avoiding the urge to turn on the heating overnight. Heated towel rails are also perfect for hanging small items of washed clothes – as long as they aren’t liable to shrink, they should be dry and ready to wear in no time! Most households heated by electricity in the UK use storage heaters. Storage heaters work by drawing and stroring cheaper off-peak electricity a few hours during the night and by releasing the heat during the day. This is why storage heaters work best for households that are on the Economy 7 tariff. Modern storage heaters are more efficient as their heat output is more easy to control while they are also equipped with a fan. These high heat retention storage heaters, do not leak heat constantly during the day and can also warm a room faster than older models. Compared to gas, you can get electricity pretty much anywhere in the UK. Interestingly, the cheapest way of heating your house using electric central heating system is by using a system that makes use of night storage heaters. Such heaters utilize electricity provided at inexpensive night rate in order to heat certain bricks that can trap heat. The bricks, in return, heat up the house with the help of the heat retained! Night storage variety of heaters release heat in a slow way, keeping a house warm for the entire day! Using immersion heater, you can make use of cheap electricity for heating water too! What is Economy 7 or Economy 10 electricity? In case you go for a night storage heater, you will get electricity at cheaper rate during the night. Such kind of cheap electricity tariff is normally called Economy 7 electricity because you get 7 hours of cheap electricity during the night. There is another tariff known as Economy 10, which provides 3 extra hours of low-cost electricity, mostly during the afternoon. If you want, you can use electric radiators too, which require normal electricity charges. But since the day cost of electricity is pretty high, you may have to spend a lot running such radiators. You should buy one only if your house has very good insulation, and there is no need for regular radiator use. Is electric central heating more expensive? Even though electricty might cost more on a day-to-day basis when compared to gas,nevertheless the overall spend of a gas heated household is higher when taken into consideration the installation cost, running expenses and average lengh of product lifetime. Electric central heating systems are more efficient, require no maintenance and last 50% longer than conventional gas heating boilers. To help you think about a potential fuel switch, we’ve outlined the annual fuel prices from a number of leading suppliers – just to give you an idea of what it will cost compared to your current tariff. The following table shows the average costs associated with electric heating systems. the extent of insulation you already have in your home. Most of the time, however, electric central heating running costs can balance out your bills in an ideal way; although monthly or quarterly fuel payments would be higher (due to the higher unit energy prices of electricity), there is less annual maintenance year-on-year. This is because individual heaters work individually with electric fuel, so the failure of one won’t lead to a complete system breakdown – meaning electric central heating boilers running costs can ultimately prove cheaper than gas in the long run! Installation should comply with all IEE and Part L1 building regulations, and should always be carried out by a fully qualified electrician or engineer. Plus you should make sure your system is fully checked over at least once every five years by a certified surveyor, who will carry out a wire safety and testing inspection just to keep you in peace of mind. There are also plenty of other ways you can continue to reduce your electric central heating bills – just switching off appliances and lights when they’re not in use, using low wattage energy saving bulbs and making sure your home is properly insulated (using curtains, double-glazing etc) can keep you and your family warm right through to spring! The average annual cost of heating in the United Kingdom for a household that comsumes around 13,100kWh for both heating and water comes appoximately to £2,456 per year according to Which?, if they are on the single-rate tariff. The cost indicated above should be used only a guide to compare costs on different types of fuel. If you are using both hot water and electricity, it is very likely that you are on a tim-of-use tariff, having cheaper off-peak rates and paying less on electricity bills. You location in the country. The age of your property. The quality of your insulation. The efficienfy of your hot water and heating system. What’s the average electricity bill per month? According to UK Power, the average bill for a 3-bed or a 4-bed house, if you use only electricity,is £49/month, or £590/year. If you live in a flat, you bill will be lower, so for 1 and 2 bed property you will pay around £34 per month on eletricity. For a 5-bed house expect to pay approximately £70 per month, or £864 per year.